It’s all Mustafi, Iwobi and Xhaka’s fault. Oh and don’t forget Ozil, how dare he sit there on the sidelines with his hands in his pocket. Well he came on. Not sure he took his hands out his pockets though. Not tracking Alexis for that run is insane on its own but he completely overran the play for the second goal! I just don’t know how much more I can handle watching him. If we have a chance of offloading him this winter I’d seriously consider it even with our CB crisis. He’s just awful. There are players you bite on the bullet on and sell at a loss to reduce the damage. Mustafi is one of those. Yep, and the loss is gonna be about 20-25m unless we find a club that is run by supremely stupid people. 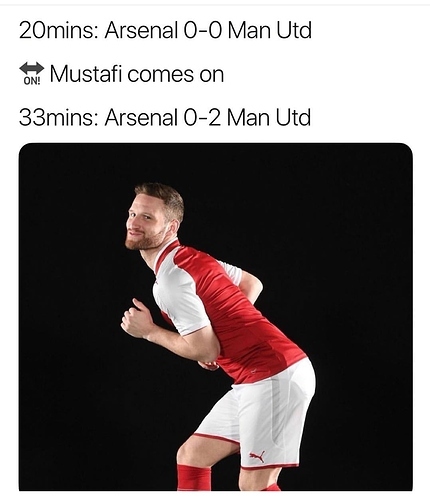 40% of it was Sokratis going off, 60% Mustafi coming on. Think hes crap but they were marauding through our midfield with options all over the pitch. Not all down to him last night when you also have fullbacks who cant do basics. Just a collective fail. What, you mean a club more stupid and incompetent than us? I’m not sure there is such a thing. It’s true, Mustafi probably wasn’t the worst defender against Man U.
Kolasinac was responsible for not getting back a few times and as a defensive unit…well we haven’t got a defensive unit. Like you say, from the players to the coaching it is a collective fail. Precisely. And it’s a sight we see far too common as an Arsenal fan. Sometimes we have to look further than the ability of our individual players. Another one of those players Wenger signed, where you think how in the hell did they think this guy was worth 35 million, Valencia are laughing all the way to the bank with that one. We’d be doing well to get at least 10 million for this guy. He’s bang average, and even when he plays good he always has a mistake in him that costs us. We be doing well getting this guy off the books and getting anyone interested in signing him. Think it’s encouraging that Emery has decided to play a veteran Koscielny over Mustafi for the very short stint of time that lasted. First sign of Shkrodders being frozen out? Going to be hard to get a club take on his wages for the next 2 seasons though, I’m not sure what he’s on but I’m tipping it’s at least double what he’s worth. Doubt he’s on more than £100K p/w really. Shouldn’t be terribly difficult to offload him in that regard. It’s more a case of who is a fan of him lol. I remember Inter being interested in his services a couple of seasons ago, maybe we can include him in a deal with Perisic. With Godin (strong rumours), Miranda, De Vrij and Skriniar as their CBs I think any interest in Mustafi is completely non existent now.